I know, these two topics seem unrelated, but I'll try to explain. First off I want to preface this entry with my intentions here. Specifically, I am not here to proselytize you to any particular view. In fact if anything, this is just a rant and a rather random observation. As you may or may not know, I've been a barefoot/minimalist runner for about seven years and a runner in general for almost twenty years. I'm not saying this to boast, but to give my background to show that I have an idea and know a bit about running. I know, being a lifelong runner doesn't really make one an expert, but let's just leave it at, I know running and barefoot running. I've been noticing a trend when people ask for advice about shoes and I recommend barefoot running. They say something like "that's not for me," or "that might be fine for you" or something similar. Anything seem familiar about those kinds of statements? To me they sound just like things one might hear in a discussion about truth objective morality versus relativistic morality. Is there really a right or wrong way to run? I'd say there's no clear cut answer to that question, but one thing is certain, there is such a thing as a more natural way to run. Does natural equal better? I wouldn't say for certain, but I can say that millions of people all around the world spend millions of dollars (more than they really have to spend) to buy things that are "natural." If you don't believe that check out Whole Foods, Trader Joe's, dōTERRA, Lemongrass Spa, Norwex, MovNat, and many many others! All these retailers seek to capitalize on the overwhelming sense that most people have that natural = better. All other things being equal (particularly price), wouldn't you pick the natural alternative over a chemical/synthetic/artificial option? So, with regards to the question of barefoot/minimalist running/walking/living, tell me what would be more "natural." I understand, we, especially in the West, fight an uphill battle against our nurture. Many (probably almost everyone) since the 1980s have been indoctrinated into the idea that barefootedness is unsafe. Like the mom in A Christmas Story, we're told not that, "you'll shoot your eye out," but that you'll cut your foot if you walk around barefoot. I won't lie, there is a definite danger of cutting your foot, but I'll be honest, in my seven years (including a half-marathon) of barefootedness I've only cut my foot a handful of times and every time it hasn't been serious. In fact the worst cut I ever got was when I was a teenager swimming barefoot and exploring an island in Michigan. That one hurt (it was right on the arch) and seemed to last forever. But, in reality the danger is minimal (pun intended)! When you walk or run barefoot you're much more attentive than you are normally and your footfall is such that you don't drag your feet across the ground. Even if you do step directly on a piece of glass you still probably won't cut your foot. The key in all this is, I think, twofold indoctrination. First, the whole it's dangerous thing, with glass and nails and rocks etc etc etc. The second and I think more difficult portion of our indoctrination is the "I have low arches" or "I overpronate/supinate" or something similar. Basically, and I blame shoe companies, we're taught from the moment we think about starting running, that everyone's foot and gait are totally different and each person needs a special shoe to deal with that difference. While there is a real difference in how everyone walks/runs, and that can make a difference when it comes to speed or style/gait one runs with. These differences do nothing to undermine the foundational truth that we are all fundamentally built the virtually same. Obviously this excludes people born with deformities or various handicaps, I'm not saying there aren't abnormalities. I'm saying that fundamentally humans are all born with the same basic bone and muscle structures. If one has a "flat foot" or a "fallen arch" do you think that person was born with that or did that happen over time? Does the person with flat feet have the same basic number of bones/joints/ligaments/tendons/muscles in his or her feet? YES! I'm not a medical professional and I haven't done direct research on why people have flat feet, but I can assure you no amount of flat-footedness will change whether or not that person can walk/run barefoot. Whether you believe in God directly creating humans or evolution through natural unguided evolutionary process humans came to be what they are today, it doesn't matter. Humans naturally are barefoot. Let's bring this back around to the relativism issue. People assume that these differences (which I feel are more the result of shoe company indoctrination) somehow preclude them from the truth that barefootedness is more natural. If that one thing is true and true for everyone then why not follow the truth? Perhaps people don't really want truth. I know in all my discussions with atheists about things relating to God they definitely don't seem honest in their seeking of the truth. I even recently read about Jerry Coyne's "conversion story" to atheism. I think in both the shoe-wearing world and in the atheist world, sticking one's head in the sand to avoid the truth is much more comfortable than dealing with the truth. It is more comfortable and easy to say, "well, that's true for you but not for me," than to really address one's views and look for the answers. Is it more reasonable to believe this or that? For more info about barefooting check out this book. For more about how belief in God is more reasonable that atheism check out this book (there are many others but that is my main suggestion today). 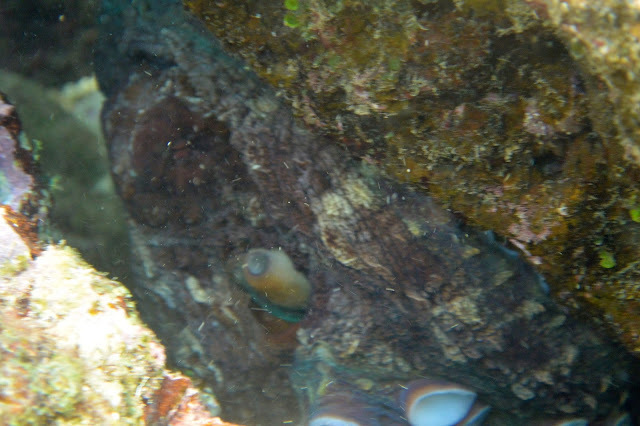 It's kinda hard to see, but that's an octopus. We found it on our last snorkeling outing.